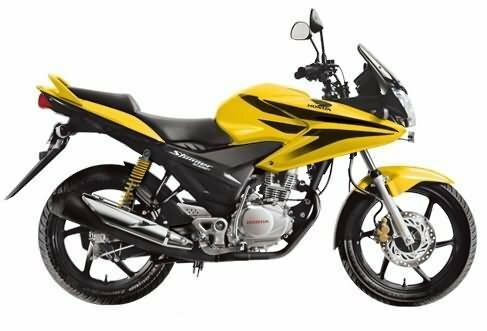 Honda CBF Stunner 125cc is a perfect blend of good looks, styling and mileage.The bike has so quickly become a craze in the Indian bike market. By launching CBF Stunner 125cc Honda has tried to attract young customers who love performance and style. Honda CBF Stunner 125 cc is a real value for money. The features of the bike can be specified as smooth and powerful engine, decent looks with neat finish, good mileage and great pickup. This is an energetic and stunning bike. Appearance: Honda CBF Stunner 125cc comes in four color combinations – Black- Orange, Black-Red, Black-Yellow and Full Black. The big flaring in front gives a super cool look to the bike. The sleek headlamps, split seats, sporty foot pegs, half fairing provide a trendy look to the bike. Comfort: Honda CBF Stunner 125cc has various comfort features. The bike has Analogue Fuel Gauge, Analogue – 1 Trip Meter, Analogue Speedometer, Passenger Footrest, Step up Seat, Pass-light, Low Fuel Indicator and Low Battery Indicator. Safety: Honda CBF Stunner 125cc has advanced safety features. The bike has Telescopic front fork suspension and 3 step spring loaded hydraulic shock absorber (rear) suspension. Honda CBF Stunner 125cc has 240mm disc (front) brakes and 130mm Drum (rear) brakes. Engine: Honda CBF Stunner 125cc consists of 124.7cc, 4 stroke, single cylinder engine which produces a maximum power of 11 bhp at 8000 rpm and a maximum torque of 11 Nm at 6500 rpm. The engine helps to maintain optimum input for maximum output. Price: The price of Honda CBF Stunner 125cc is Rs.60,500 (taking Mumbai as base price location). However, the price specified is indicative price only and reflects lowest approximate price which excludes tax, registration, insurance and cost of accessories.